​What are the goals of NAMI Peer-to-Peer eduction? To provide guidance on locating appropriate supports and services within the community and offer tips of advocating for those supports and services. Ten Week Course Begins January 5, 2019. 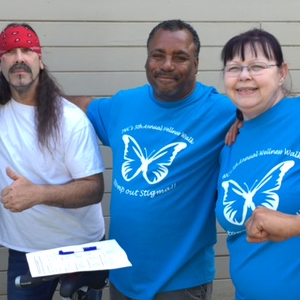 NAMI San Joaquin County, the local organization of the National Alliance on Mental Illness, will sponsor its NAMI Peer to Peer Education Program. The course is specifically designed for adults living with mental health challenges. Peer to Peer provides an educational setting focused on recovery that offers respect, understanding, encouragement and hope. The NAMI Peer to Peer education program is a 10 session course held twice a week for (2 hours) taught by trained Mentors living in recovery themselves. Peer to Peer emphasizes that recovery from mental illness is a feasible and supportable goal. The course is a great resource for information on Mental Health Challenges, recovery, coping skills and relapse prevention. The course is free and open to the public. To REGISTER please contact us to register for the NAMI Peer to Peer Class! Peer-To-Peer is a 10 week series of classes that help clients along the path to recovery. People who attend report a greater understanding of their diagnosis, and a bond with others in the class. The classes are small, and are a safe place to share and learn. The emphasis is on relapse prevention and psycho-social supports. The ultimate goal is for recovery and self-advocacy. The course was written by a client, and all classes are led by clients. Free presentations presented by people living with mental illness. NAMI Connections is a peer-based mutual support group for people facing mental health challenges. Led by clients, for clients. There is no need to register for this free group. Every Friday 6:00 p.m. - 7:30 p.m.
6:00 p.m. to 7:30 p.m.
All content copyright © NAMI San Joaquin County. All rights reserved.